Some rescues are difficult, and some are easy. 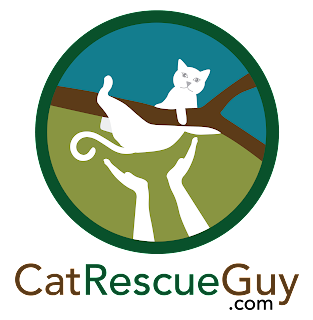 While I enjoy the challenge and reward of a difficult rescue, I really love easy rescues. When the tree is easy to climb, and the cat is sweet and cooperative, it makes for a quick and easy rescue. Pepper was an easy rescue. When Pepper was found about four months ago as a small kitten under a neighbor's house, Susan took her home, bottle-fed her, and nursed her back to health. Not only did Susan save Pepper's life, she also adopted her as her own and gave her a loving home. It takes a kindhearted person to do all that. Pepper had been in the tree in her backyard only one night, but it was a very long night for Susan and her husband who both tried everything they could to get her down. 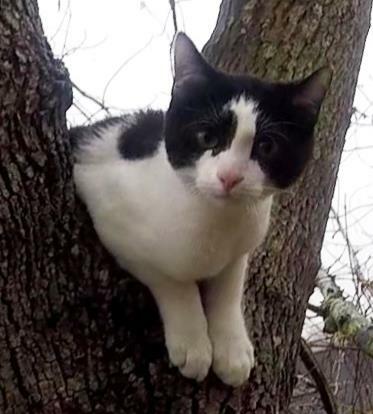 When I arrived the next morning, Pepper was about 20 feet high in the tree and crying for help. When she saw all the attention she was getting down below, she managed to climb down about five feet, but she could not be coaxed to go any farther. Pepper was not disturbed by the activity I caused in the tree above her when I set my rope in the tree. In fact, she seemed very curious and interested in it. 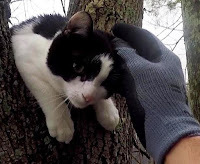 I watched Pepper as I climbed up toward her, and she was not frightened by my approach at all. When I got within reach of her, I held my hand out to her to sniff, and when I passed the sniff test, I gave her a few gentle stokes on her cheek with my finger. She was perfectly comfortable with me, so I climbed up a little higher. She was very comfortable and curious about me, so I decided to give her the option of walking directly into the carrier. She sniffed it out thoroughly and stepped inside with just her front legs, but would not go all the way inside. I thought I should give her a stronger reason to go inside, so I opened a can of food and showed it to her. She sniffed it, but was strangely not particularly interested in it. She didn't take one bite. In spite of her lack of interest, I put the food in the back of the carrier and gave her another chance to walk inside. This time, she walked all the way inside. I closed the door and she offered no complaint. It was a quick and short ride down to the ground where Susan was waiting. Susan took Pepper inside and released her. When I came inside just a few seconds later, Pepper greeted me and rubbed against me as if to say "thank you." Pepper ate a bit and then was ready for some playtime. She was happy to be back home again, and I was happy to see her there. I remembered to bring my camera and turn it on this time, but I had my head turned in an odd angle at the crucial time and missed most of the action. 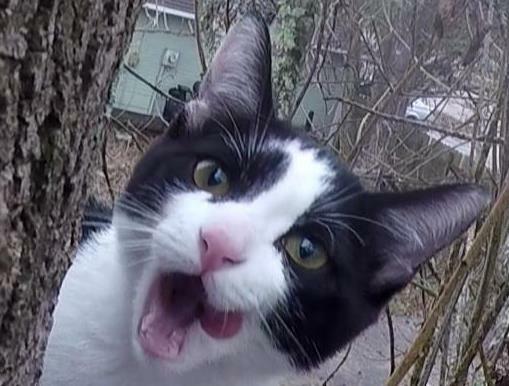 While I was able to get a few frame-grabs of Pepper to use here, the video is unworthy viewing. Thanks, Pepper, for an easy rescue. And thanks, Susan, for saving her life.